So much for getting off to a quick start. In Game 2 of 82, the Rangers didn’t show much resistance to start the first period. It resulted in the very dangerous Maple Leafs scoring five goals on Henrik Lundqvist chasing him en route to a 8-5 win in Toronto. That makes the Rangers two for two so far. In losing their first two games, they’ve allowed 12 goals. At least the home opener was competitive. In Lundqvist’s words, it was embarrassing. They didn’t backcheck and allowed the supremely skilled Leafs to do whatever they wanted. Following a Dominic Moore deflection for the first goal, J.T. Miller got his first by deflecting home a Chris Kreider shot in front to even the score. Miller was one of the few bright spots notching a goal and assist. But that was only offensively. The Leafs responded by scoring the next four. It started when Zach Hyman took full advantage of a bad turnover from Tony DeAngelo. He tried a pass that didn’t work landing right on the stick of William Nylander. He quickly got the puck over to Hyman, who tucked it in past a sprawling Lundqvist. Jake Gardiner then proceeded to skate through Brendan Smith, Mats Zuccarello and Brady Skjei to go short side top for a power play goal increasing to 3-1. Lundqvist completely missed Nikita Zaitsev’s point shot with Smith partially screening him by going for a block. It was still stoppable. It was pretty obvious that the Rangers couldn’t handle the Leafs’ speed. The crazy part is Auston Matthews didn’t score a goal. That’s how talented they are. He had a primary assist on a back breaking goal later. Thirteen different Leafs hit the scoresheet. As if Lundqvist’s night couldn’t get any worse, he had his own teammate Michael Grabner put a puck past him to make it 5-1. He went to cover the puck when Grabner accidentally put it in his own net. A goal credited to Hyman. Before the period let out, Kevin Shattenkirk scored a power play goal to give the team some hope. With 23 seconds remaining, his wrist shot from the right point got past Frederik Andersen thanks to a double screen from Kreider and Pavel Buchnevich. Mats Zuccarello and Kreider drew assists. Trailing 5-2, coach Alain Vigneault gave Lundqvist the rest of the night off. Ondrej Pavelec made his first appearance. To his credit, he was good. The former Winnipeg Jet made some key saves giving his team a chance for a comeback. They certainly didn’t quit. It might not have been the result they wanted. But the Blueshirts showed a lot of heart rallying from a four goal deficit to tie the score in a dominant second stanza. Mika Zibanejad stayed hot to start the season by notching his team-leading third goal. All three have come on the power play. Shattenkirk once again set him up for his big shot that found twine. Zuccarello assisted. He had a big night recording a career high four points. With the defense struggling, new assistant Lindy Ruff changed all three pairs. He shifted Shattenkirk to the second unit with Skjei while surprisingly moving up Marc Staal to pair with Ryan McDonagh. He and Shattenkirk have struggled so far together caught on for too many goals against. Staal stayed on the left side while the versatile McDonagh switched to the right. Astonishingly, the move worked. Staal played a very good game even factoring in on the next two Ranger goals. Not known for his offense, the proud veteran went to the front of the net on a delayed penalty and redirected a Zuccarello shot pass to cut it to 5-4. He showed some emotion afterwards. The comeback wouldn’t have been possible without a couple of huge stops from a sharp Pavelec. He played well. In relief of Lundqvist, he stopped 21 of 24 shots. Lundqvist allowed five on 17. The third could’ve gone either way. But controversy impacted the game. Mitch Marner had a puck caught in his uniform as he gained the Rangers blueline. The play continued. Eventually, the Leafs spent a extended shift in the Ranger zone tiring them out. Finally, Marner fed a wide open Tyler Bozak in front for a one-timer past a helpless Pavelec. The entire five man unit got caught standing still including Miller and Shattenkirk, who were the closest. Vigneault saw something. He went for a offsides challenge to try to negate the goal. Considering the replays showed Marner with a puck in his paraphernalia, it’s hard to conclude that he had clear possession. Joe Micheletti didn’t think so. Neither did my friends as we watched it in my buddy’s house in South River. It really should’ve been reversed. Interestingly, Vigneault agreed with the ruling. Instead, they held it up giving the Leafs a 6-5 lead. Typical Toronto. Even in a game the Rangers had no business being in, they got screwed. All due to the Toronto bias. Not only did it put the Rangers behind, but due to the new rule on a failed offsides challenge, they were penalized. Exasperating is one way to describe the NHL. Kevin Hayes made it worse by taking a slashing minor handing Toronto a goal. You can’t give them that many opportunities. Matthews got his one assist when he made a brilliant one touch feed leading Nylander in on Pavelec, who had no chance on a brilliant backhand that caromed off the crossbar right to Leo Komarov which made it a two goal swing. That was it. Nazem Kadri added another PPG for final bookkeeping. In total, there were nine power plays. The Rangers went 2 for 3 while the Leafs were 3 for 6. So of the 13 total goals, five were scored on the power play. It would be very easy for me to kill the Rangers for last night. They weren’t ready and didn’t compete. The lack of backchecking was disturbing. So was the defense. In particular, Smith who was caught out for three goals against. He didn’t have a good preseason. I wouldn’t worry. He’s only signed for three years. They can’t expect Staal to have good games consistently. He was by far their best defenseman. Not good. I think they should keep Shattenkirk with Skjei, who at this point is a better defensive defenseman than McDonagh. Skjei keeps opponents honest. Use McDonagh and Shattenkirk for offensive zone starts. What will they do against Montreal tonight? Would you really keep Staal with McDonagh? Smith and DeAngelo can be a third pair. So can Staal and DeAngelo, who could be in the press box for Nick Holden. 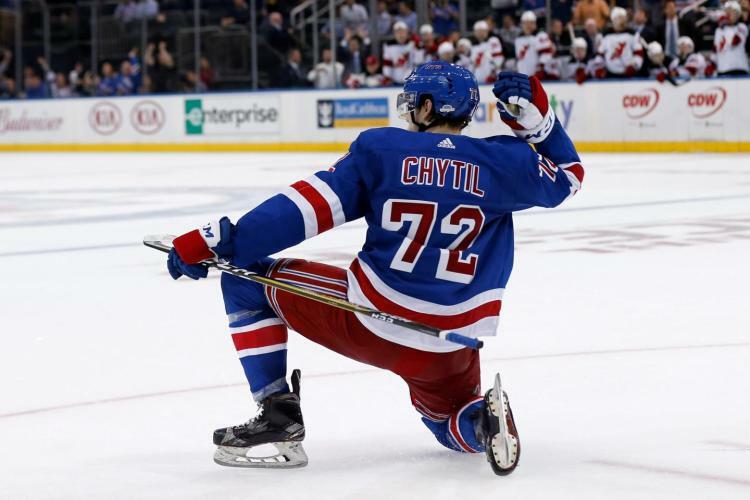 My only gripe is the lack of confidence Vigneault has in Filip Chytil. He didn’t even play five minutes last night not taking one shift in the third. How is he supposed to learn? It’s on the coach to play the kid more. He’s got unique skill that the team lacks. Before it gets to nine games, let’s see what he can do. This entry was posted in NYRangers and tagged Alain Vigneault, Auston Matthews, Brady Skjei, Brendan Smith, Chris Kreider, controversy, Dominic Moore, Filip Chytil, Frederik Andersen, Game recap, Henrik Lundqvist, J.T. Miller, Kevin Shattenkirk, Leo Komarov, Lindy Ruff, Maple Leafs, Marc Staal, Mats Zuccarello, Mitch Marner, Nikita Zaitsev, NYRangers, offside challenge, Ondrej Pavelec, Paul Carey, Ryan McDonagh, Tony DeAngelo, Tyler Bozak, William Nylander, Zach Hyman. Bookmark the permalink.